T he Woburn Public Library, founded in 1856, moved to its location on Pleasant Street in 1879. 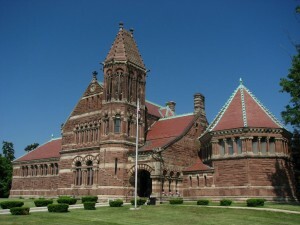 The first library designed by acclaimed architect H. H. Richardson, the building is a National Historic Landmark. The Woburn Public Library serves as the hub of the community, connecting residents to resources, services, and experiences that educate, enrich, and entertain. The Woburn Public Library is recognized as a transformative organization, advancing the needs of the community in the areas of literacy, workforce development, civic engagement, and culture.